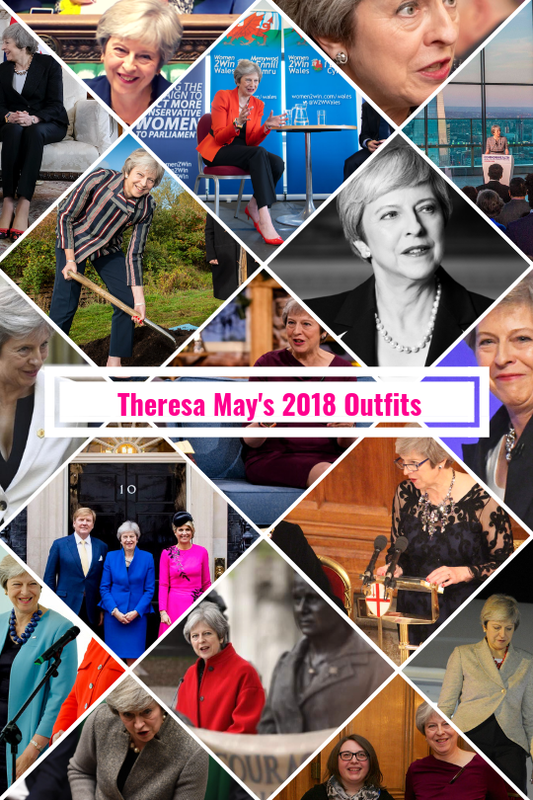 We've made it to December - and it's time for your recap of Theresa May's epic 2018 outfits! 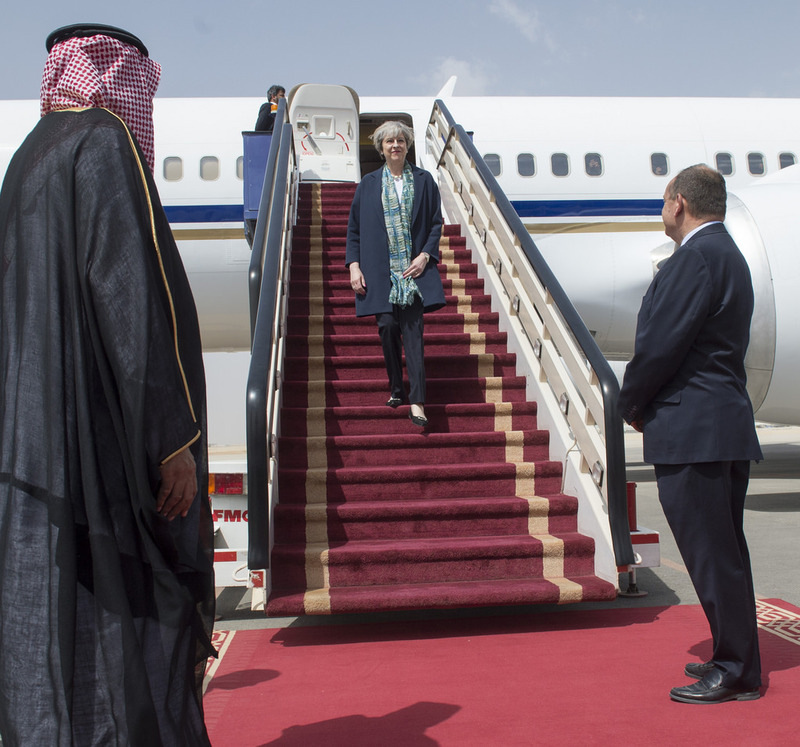 It's certainly been a year like no other, but the PM's sense of awesome style has remained constantly chic. Here's my favourite outfits, month by month. 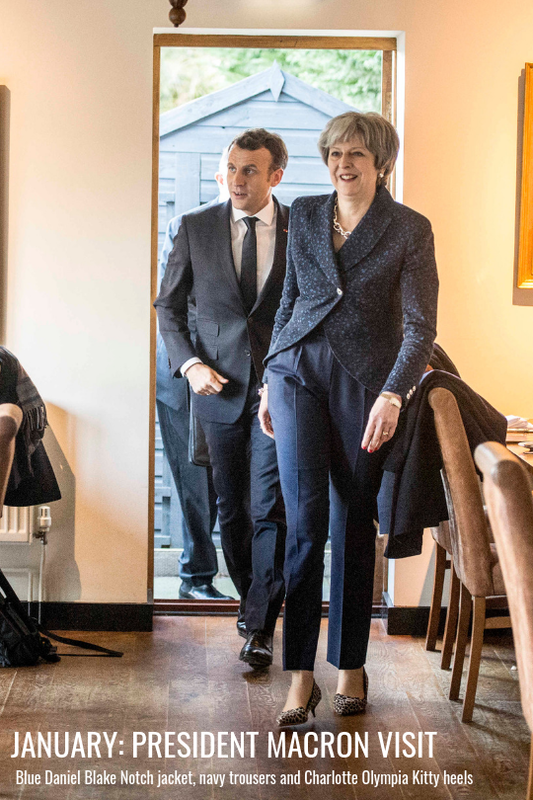 Welcoming President Macron to the UK, the PM wore her navy blue Daniel Blake Knotch Military jacket, navy trousers and her Amanda Wakeley oversized silver necklace and bracelet. She picked the Charlotte Olympia leopard Kitty kitten heels - all our favourites in one outfit! 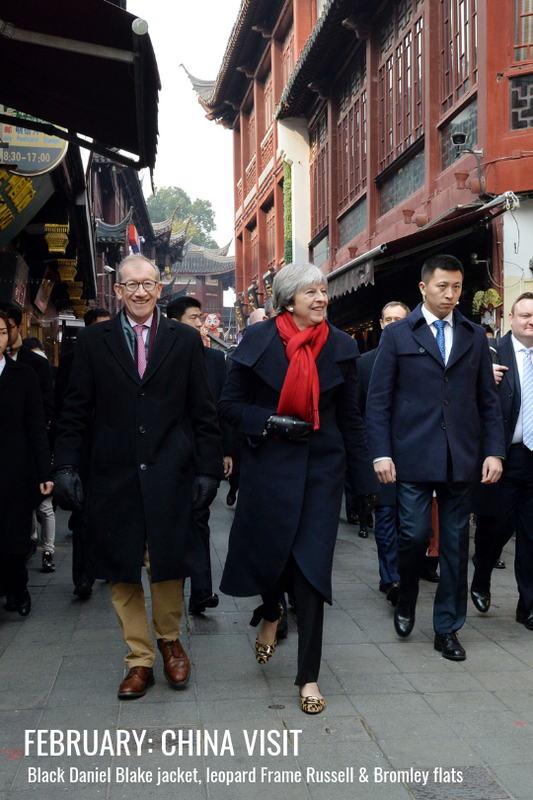 On her first visit to China as the Prime Minister, May wore a fantastic tailored black jacket from Daniel Blake. 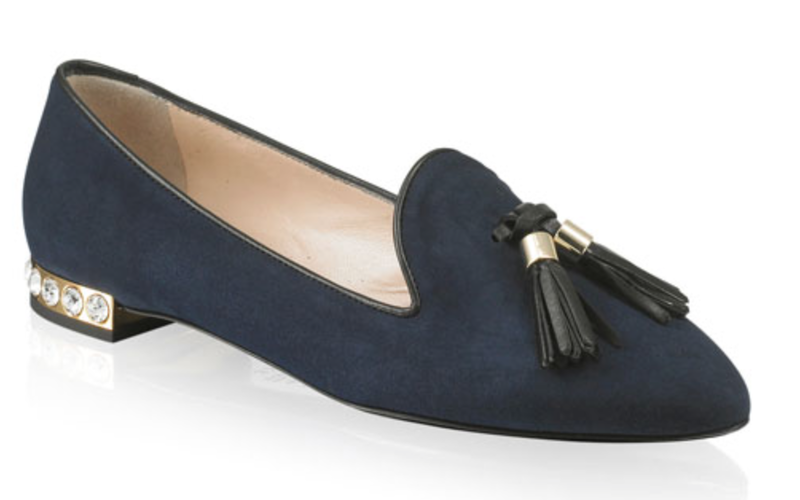 She added a bit of 'May magic' with the leopard Frame flats from Russell & Bromley. Another meeting, and another Daniel Blake dress - this time the Hybrid in wool mohair. 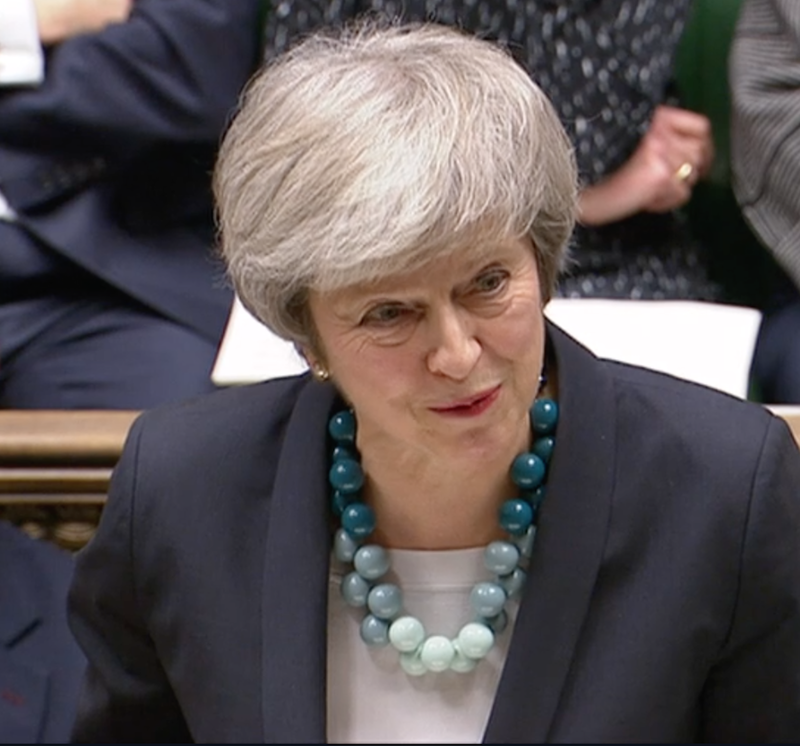 May kept it simple with a pair of navy kitten heels from Russell & Bromley, but showed some pizazz with an oversized Bakelite chain necklace and earrings. And another honourable mention goes to the purple Daniel Blake Origami jacket and matching skirt - teamed with the eye-catching red Link In block heels from Russell & Bromley. 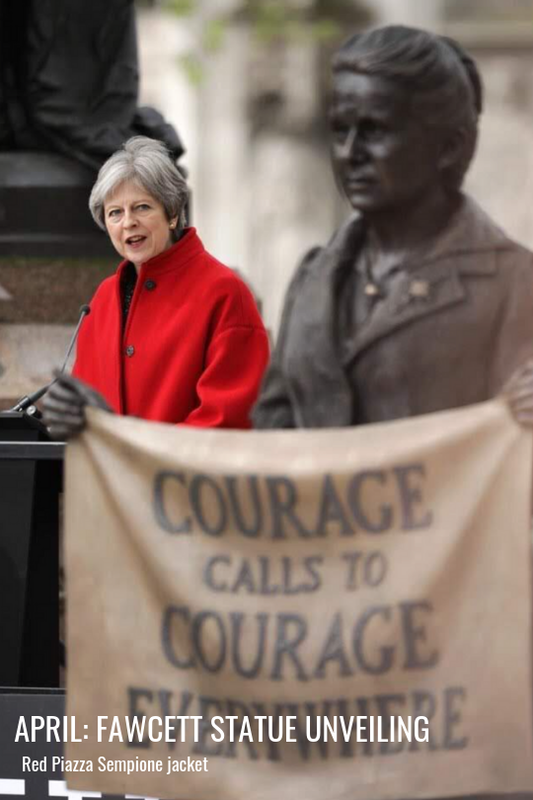 The PM unveiled the Millicent Fawcett statue in Parliament Square - wearing an equally inspiring red jacket from Piazza Sempione - and the leopard Charlotte Olympia heels. 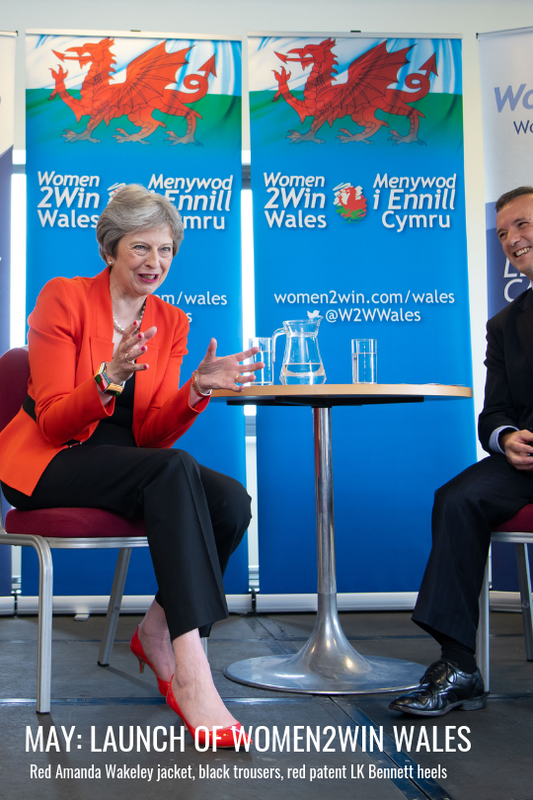 It was a special month - and one where I met the PM for the launch of Women2Win Wales. Perhaps in a tip to the dragon on our flag, May wore her red Amanda Wakeley jacket and the red patent LK Bennett kitten heels. 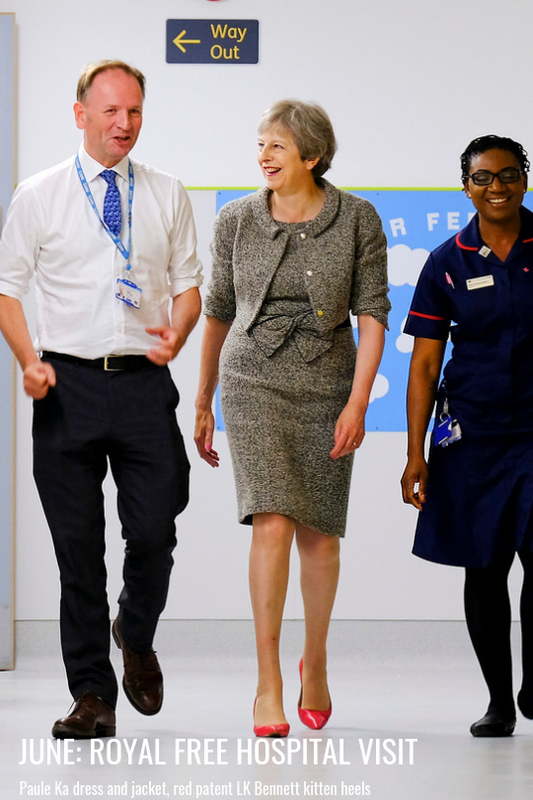 The Prime Minister and then Health Secretary Jeremy Hunt visited the Royal Free Hospital to announce a record investment in the NHS for its 60th birthday. May rewore an old favourite (all round!) 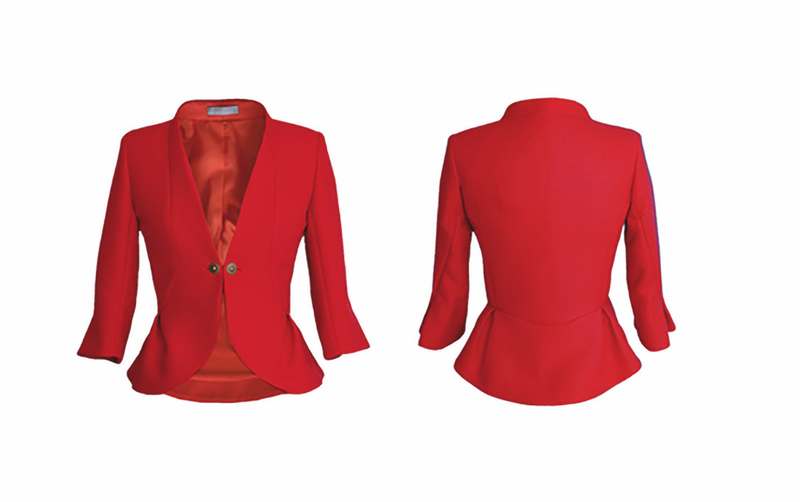 - the grey boucle Paule Ka dress and matching jacket, adding a pop of colour with the red patent LK Bennett kitten heels. Summer months = bright colours. 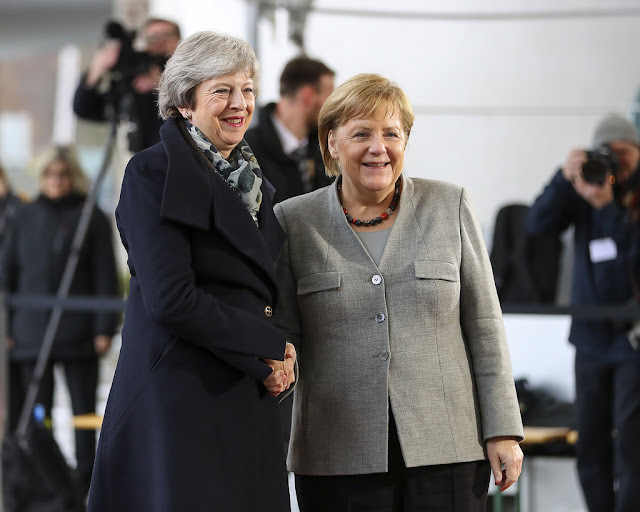 May wore several shades of blue on her visit to Berlin - opting for the turquoise coat, a navy shift and the dusky blue Rosehip kitten heels from Russell & Bromley. 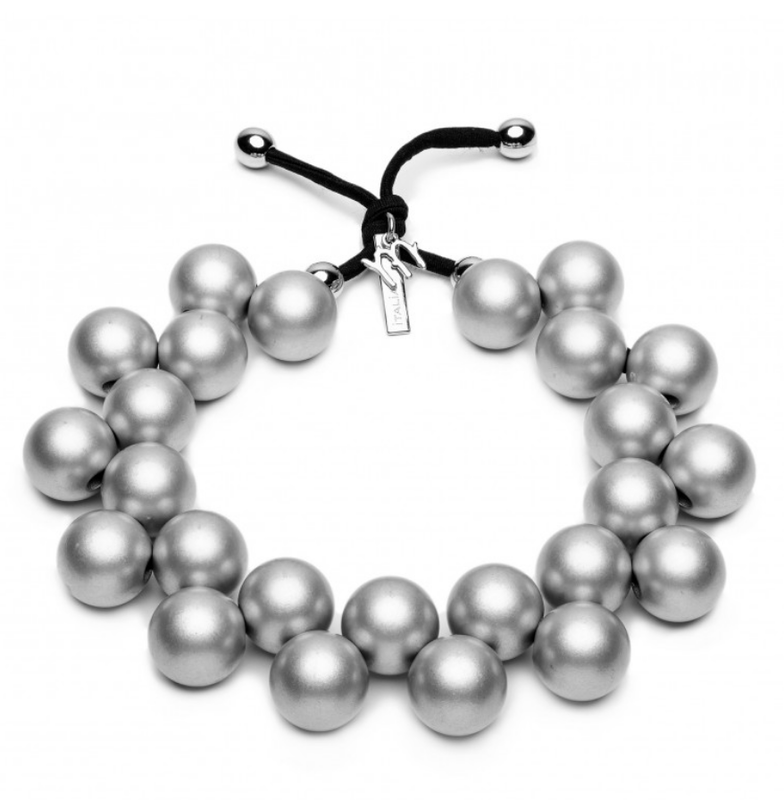 May also wore one of her Balls necklaces from Mirta Bijoux. 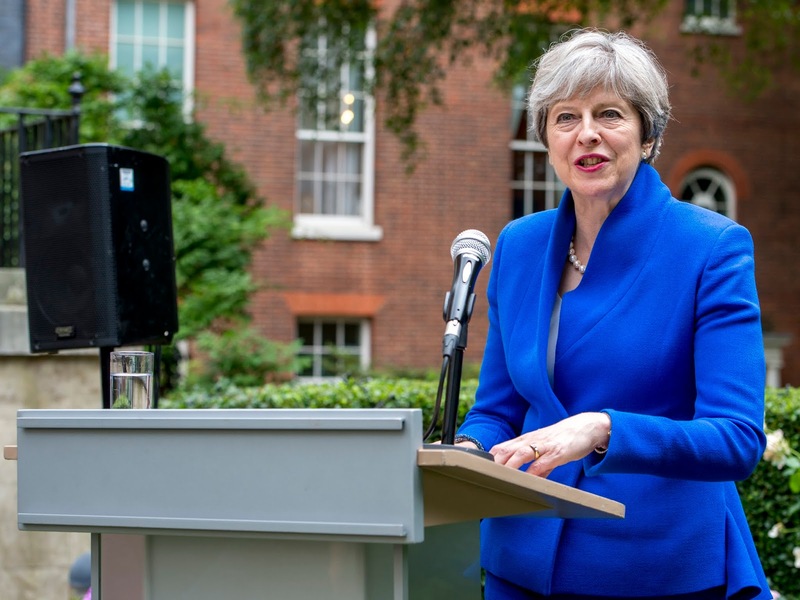 And an equally fab outfit was her bright white Peserico jacket and navy Amanda Wakeley dress for the RAF 100 celebrations. I absolutely loved her new fierce new fascinator from Liz Felix. 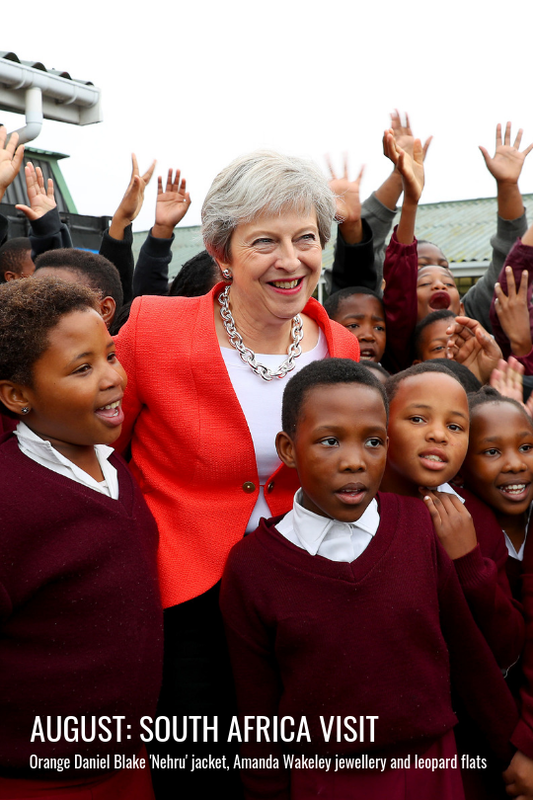 Making her first visit to South Africa as Prime Minister, May wowed the crowd in the bright orange Nehru jacket from Daniel Blake - and a pair of pointed leopard flats from the staple Russell & Bromley. In New York for the annual United Nations General Assembly, May turned to an old, classic staple - a black trouser suit from Amanda Wakeley and an elegant ivory blouse. She accessorised with two of our favourites - the Amanda Wakeley oversized necklace and bracelet and a pair of leopard Delicious bow adorned flats from Russell & Bromley. 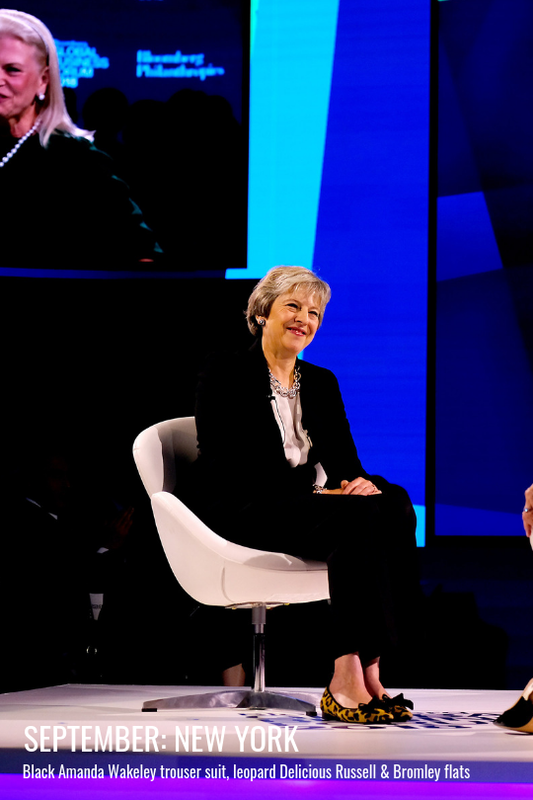 And bonus selection - we can't forget May dancing onto the stage at Conservative Party conference, with a great pair of Curve heels (with glossy red accents) from Russell & Bromley. 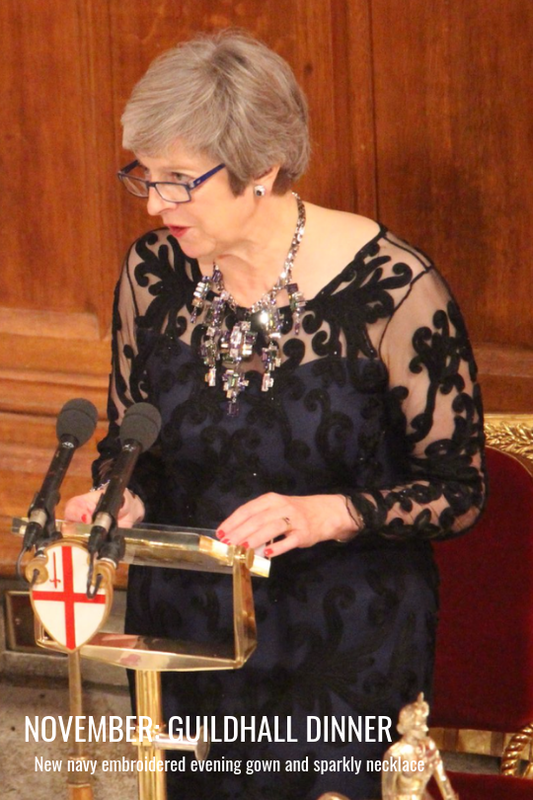 May debuted a new dress for the annual Guildhall Dinner. I'm still on the hunt for the embroidered gown and equally showy oversized necklace- send any tips my way! 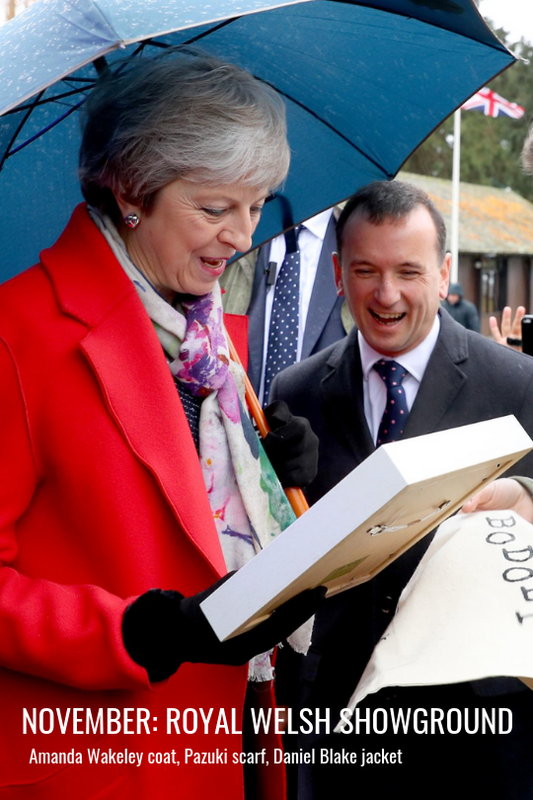 But what I did love (and can ID) was May's outfit to the Winter Fair at the Royal Welsh Showground. 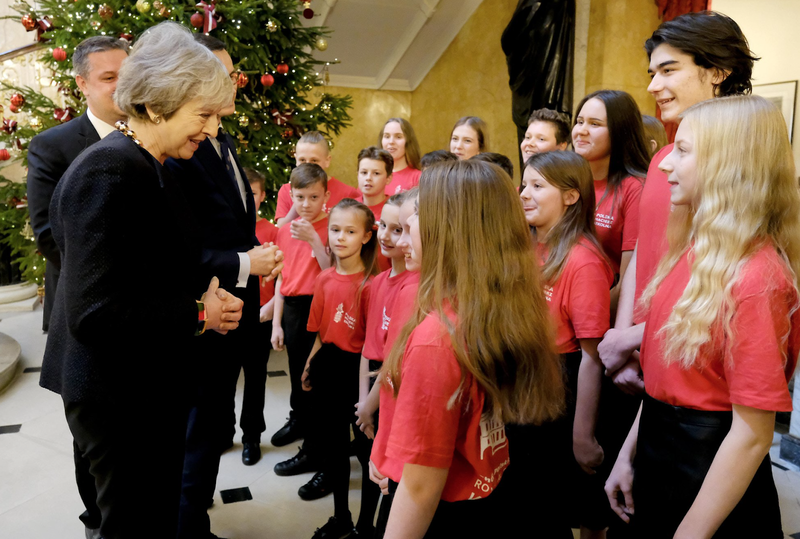 An old red wool coat from Amanda Wakeley provided a suitably festive touch whilst the PM accessorised with a Pazuki scarf. 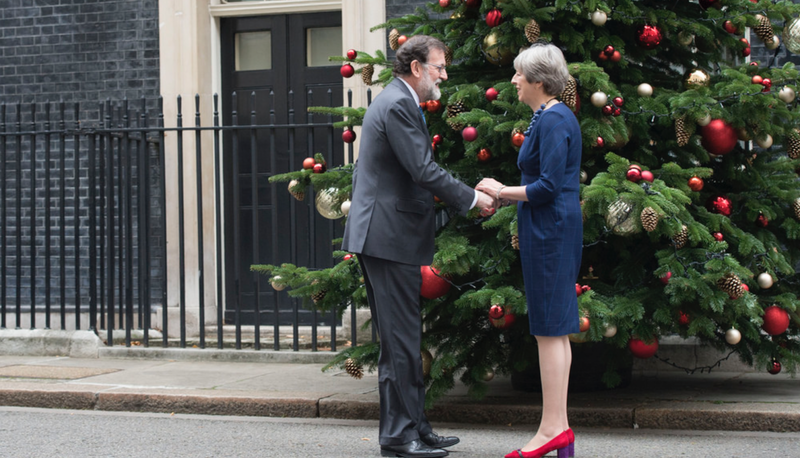 May wore this favourite dress for Christmas Day celebrations, teaming it with her red Amanda Wakeley coat, another Pazuki faithful scarf and her Anya Hindmarch Buddy bag. All top choices! Here's to an equally stylish 2019! 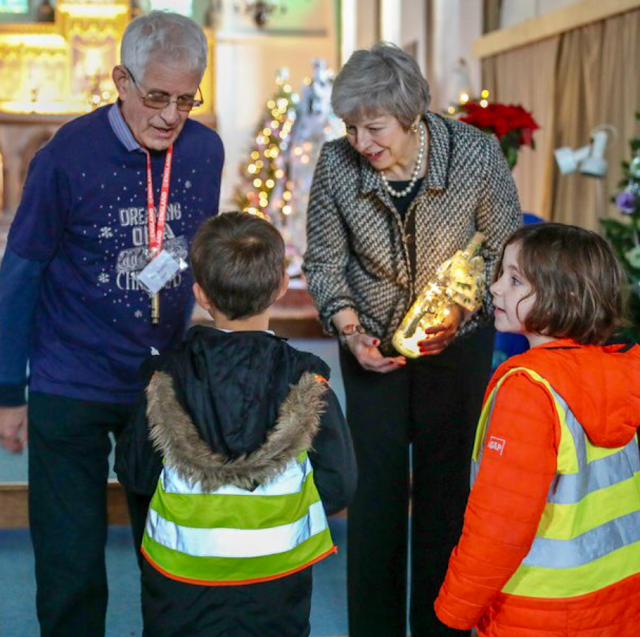 What's been your favourite Theresa May outfit of 2018? Let me know in the comments! It's that time of year when we get excited for the Russell & Bromley sale! 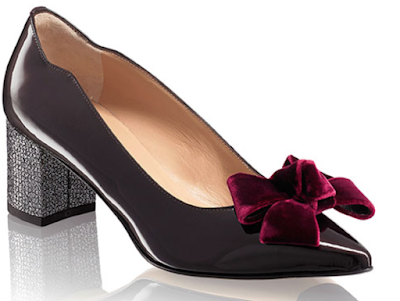 Here's our top picks that we're adding to our basket! It was the last week in Parliament before the Christmas recess - here's what the Prime Minister got up to! 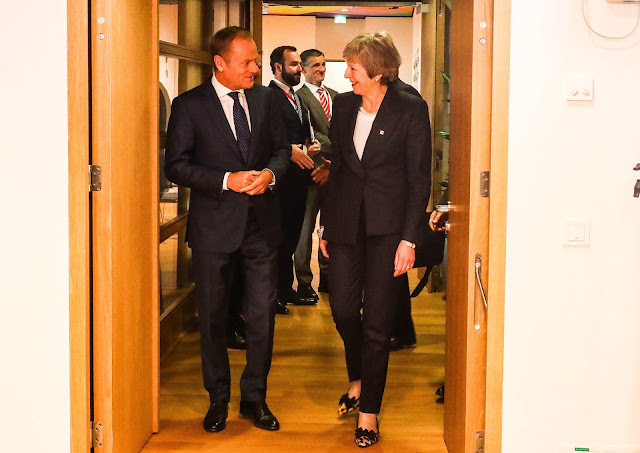 On Monday, the PM was in the Chamber providing an update on the EU Council meeting. 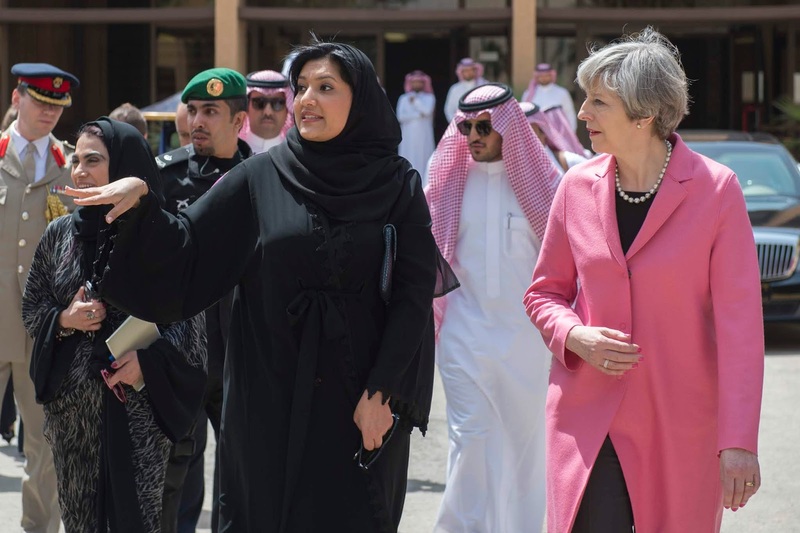 She wore her grey Peserico blazer with a black top and skirt - her leopard ankle boots provided some extra sass. 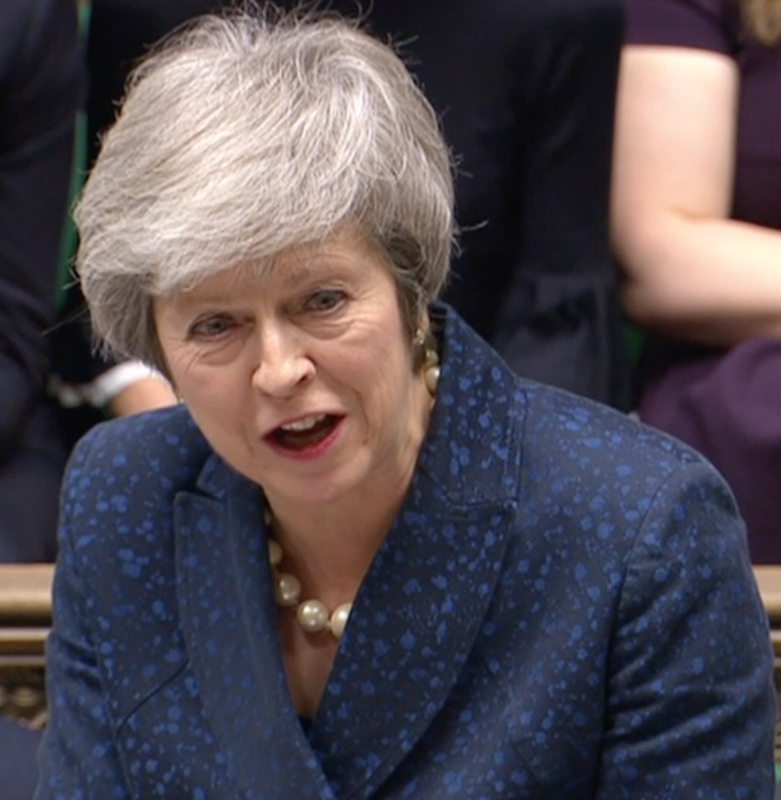 On Wednesday, May headed to the final Prime Minister's Questions before Christmas. She wore her bright blue Daniel Blake Orchid jacket and matching skirt, accessorising with the leopard Charlotte Olympia kitten heels and her Amanda Wakeley silver chain necklace and bracelet. 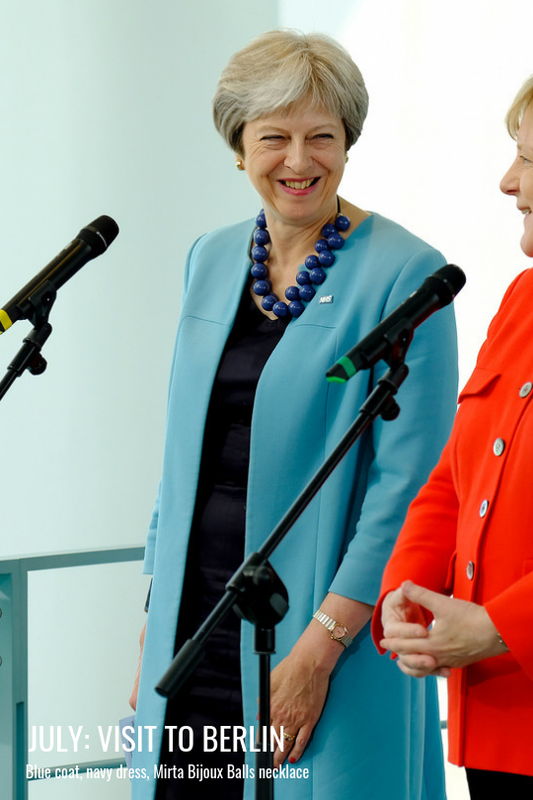 Later in the day she visited Heathrow Airport's T5 to mark the launch of the Government's immigration white paper. 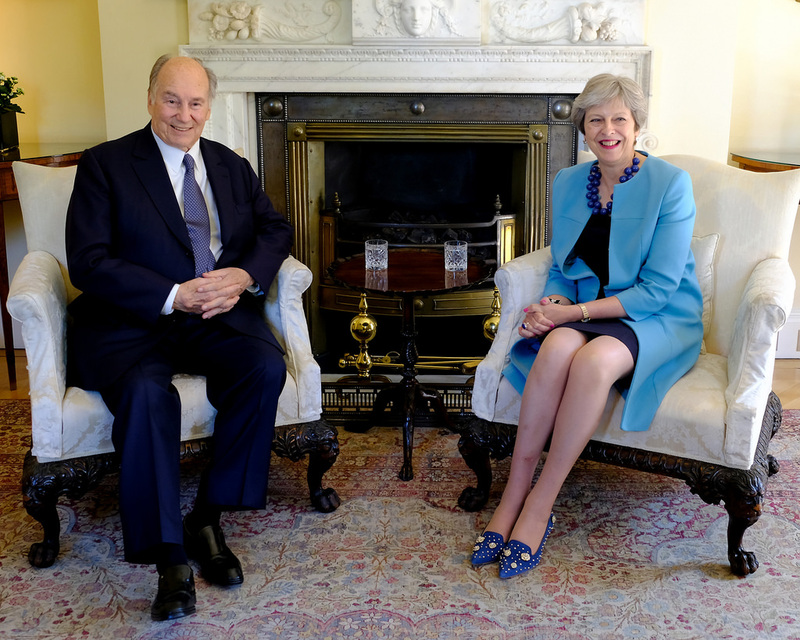 And on Thursday, the PM welcomed her Polish counterpart to Downing Street for a bilateral meeting and event at Lancaster House. 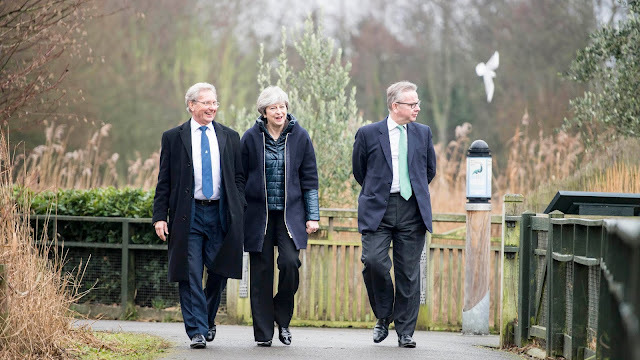 May wore her black Daniel Blake jacket with trousers, her new gold bead necklace and the lip print flats from Russell & Bromley. We've not seen them for a while! From a long week in Westminster, to two trips to Brussels, here's a recap of Theresa May's week. On Monday, the PM was in the Commons, where she provided an update on the Brexit vote. 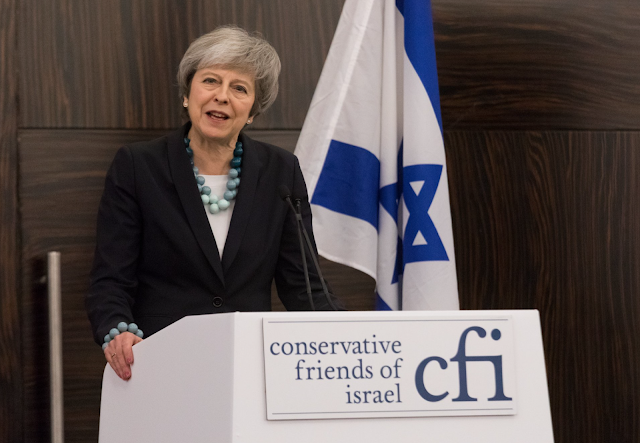 Before this, May attended the Conservative Friends of Israel Dinner. 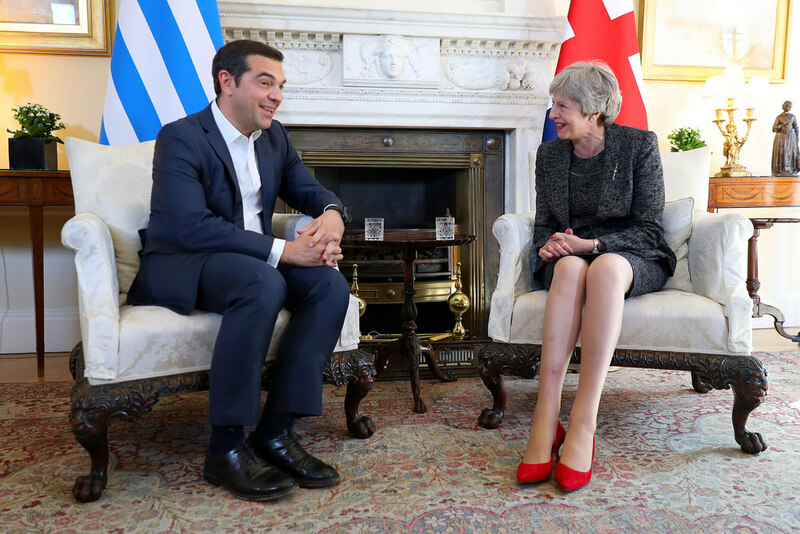 The PM wore her navy Herno jacket with trousers, accessorising with the multi colour blue Mirta Bijoux Balls necklace and bracelet and the Divine flats from Russell & Bromley. 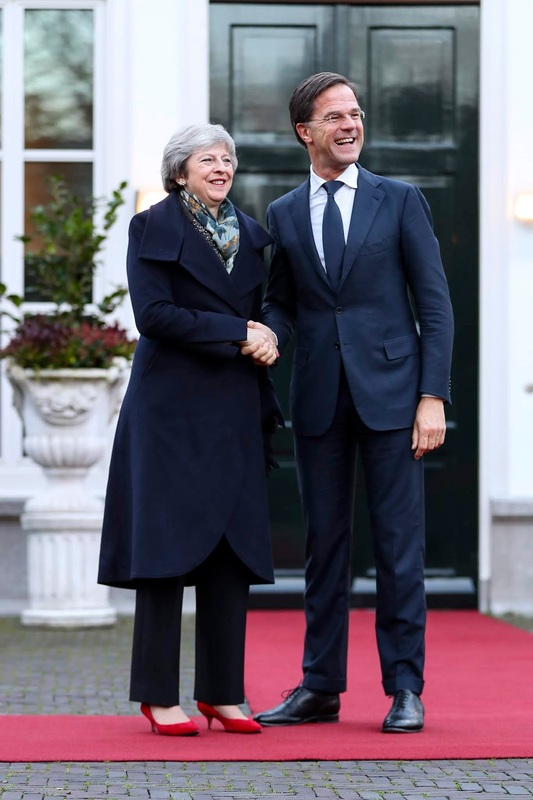 On Tuesday, May travelled to the Netherlands, Berlin and Brussels to meet with European leaders. 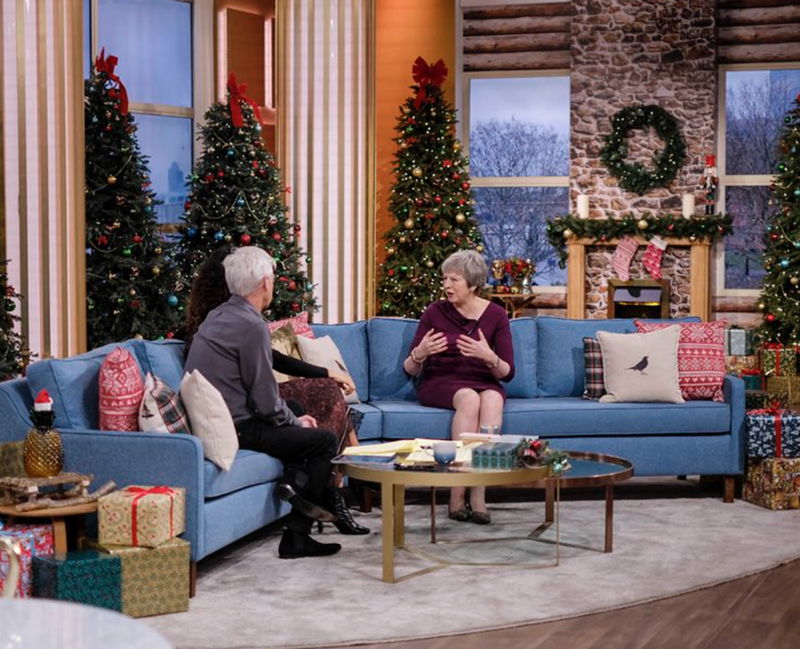 The PM kept warm in her custom Daniel Blake navy military coat, and wore a brown tweed belted jacket, trousers and the red suede Audrey kitten heels from LK Bennett. 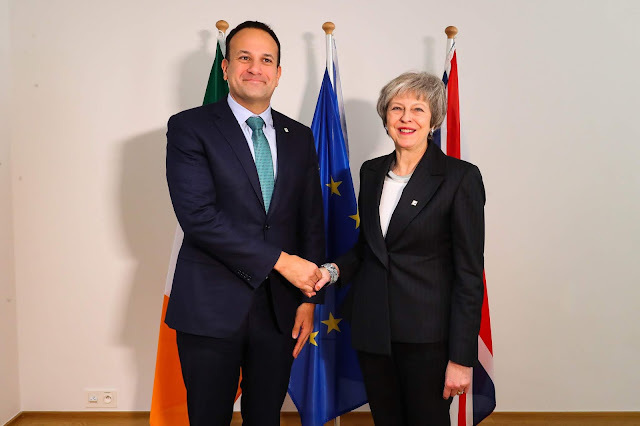 Wednesday started early for the PM, and May delivered a statement on the confidence vote at 8am in Downing Street. 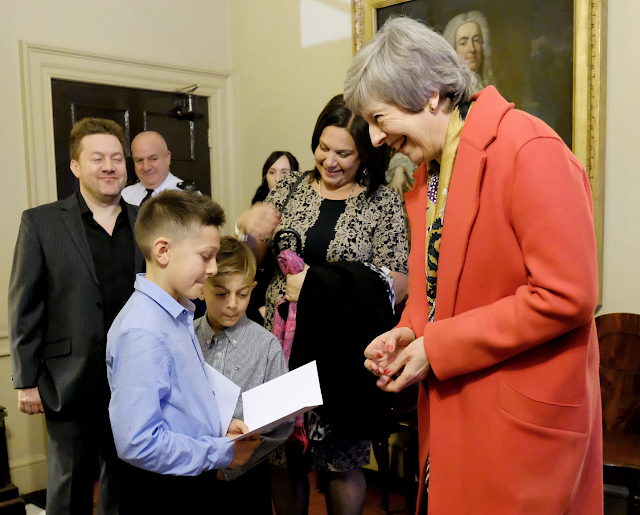 The PM wore our favourite navy Daniel Blake jacket with trousers, and the navy Twiggy kitten heels from Russell & Bromley. 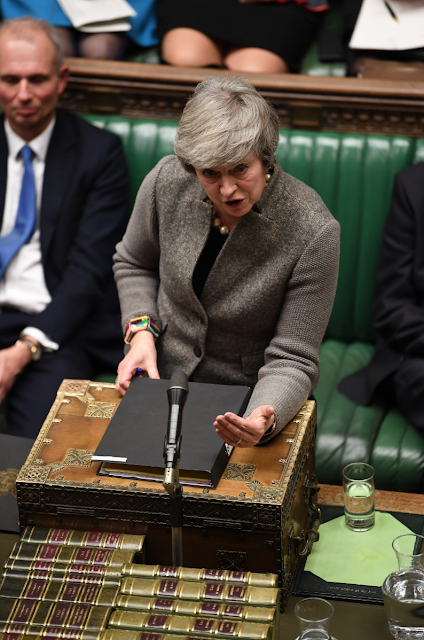 She also took part in Prime Minister's Questions and delivered another statement at 9.30pm after winning the vote. 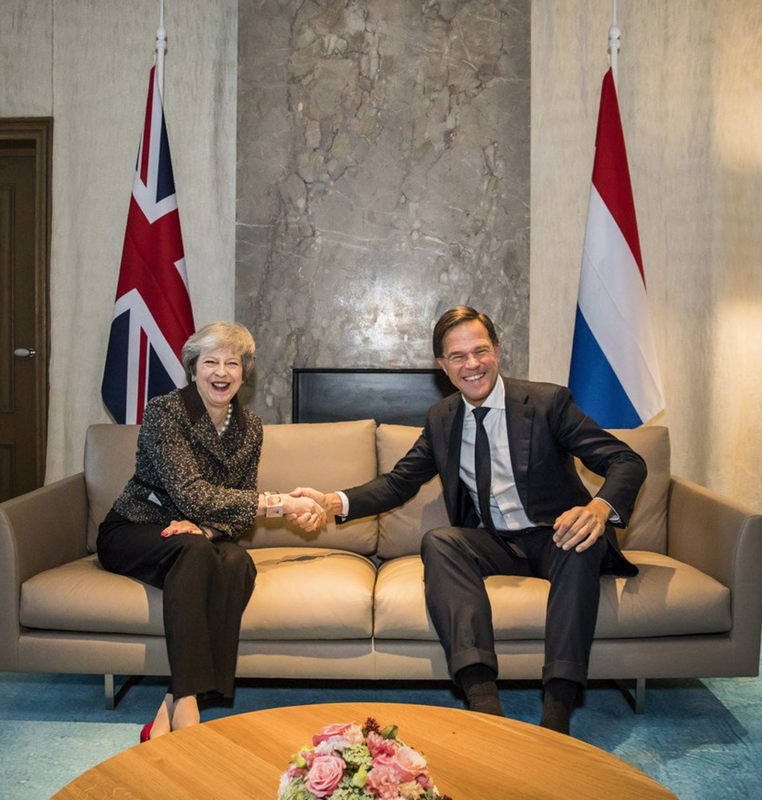 On Thursday, the PM returned to Brussels. She wore her grey Daniel Blake suit, accessorising with the leopard Delicious flats, and some cool chunky jewellery. 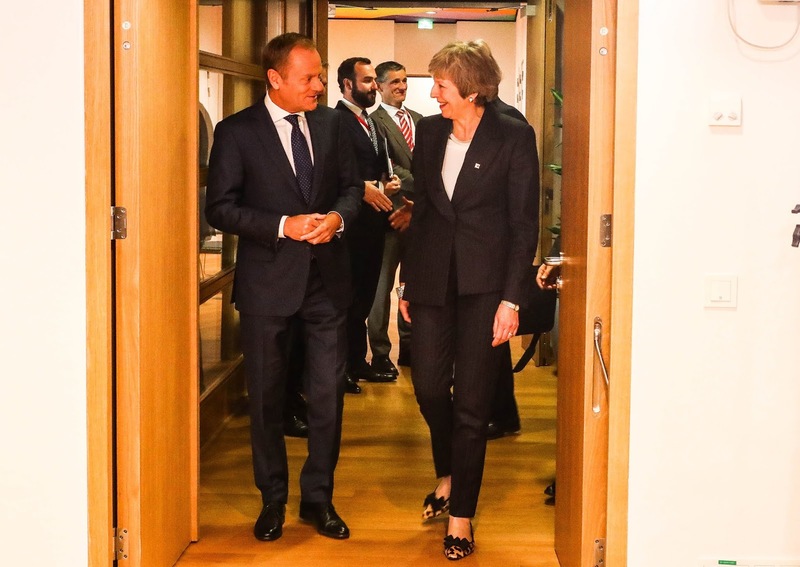 On Friday, May spent her second day at the EU Council. She wore the brown floral Paule Ka jacket, teaming it with a skirt and some awesome leopard boots. This week the PM turned on the Christmas tree lights in Downing Street! Here's what else she has been up too. On Monday, May appeared on This Morning to discuss the Brexit deal. 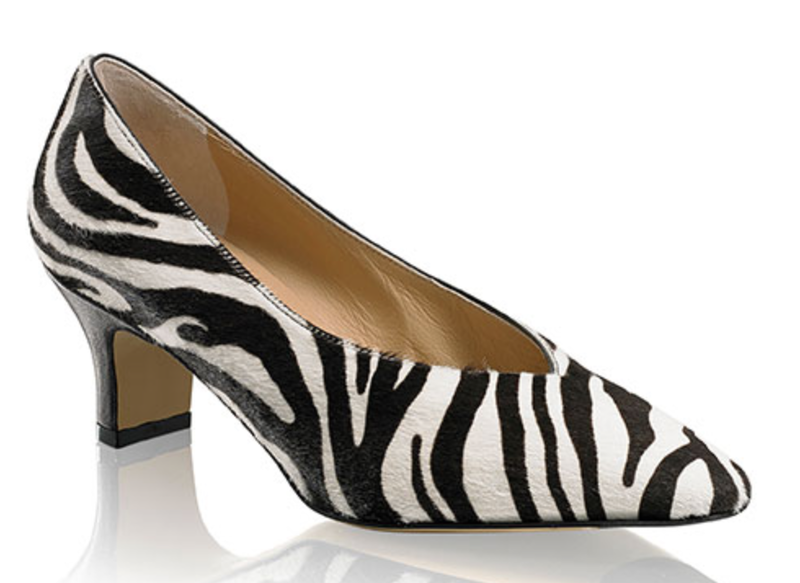 The PM wore her purple Escada dress, teaming it with the leopard Kitty heels from Charlotte Olympia. 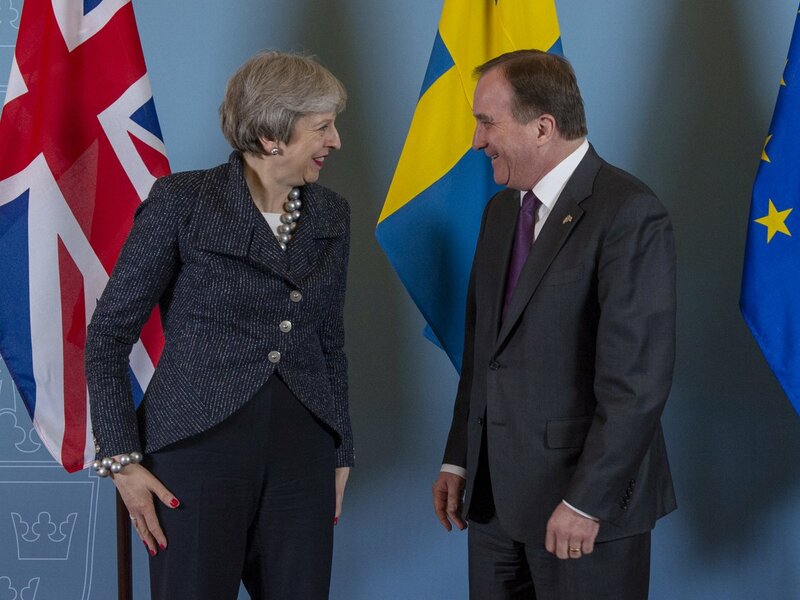 Later in the day she updated the House on the G20 Summit. 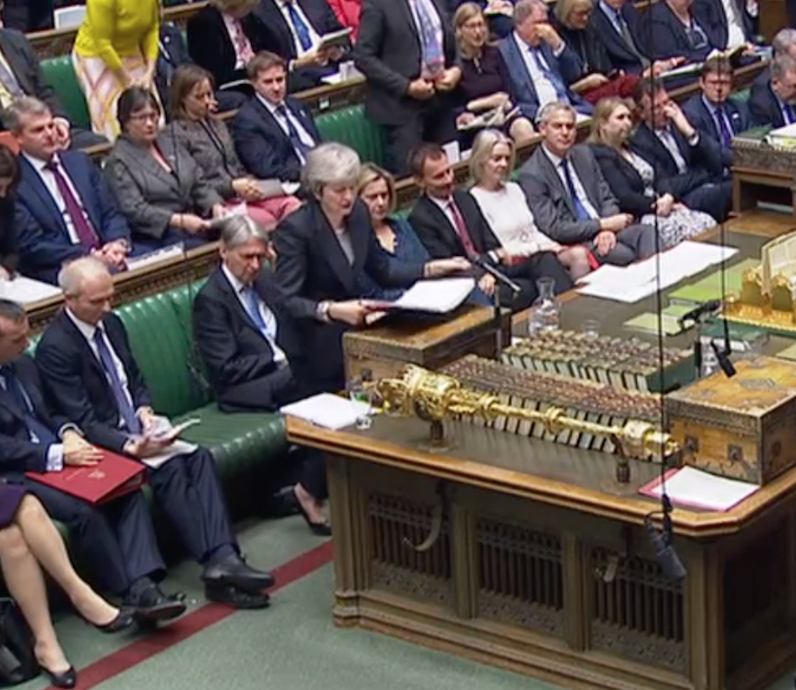 On Wednesday, the PM was back in the Commons for Prime Minister's Questions. 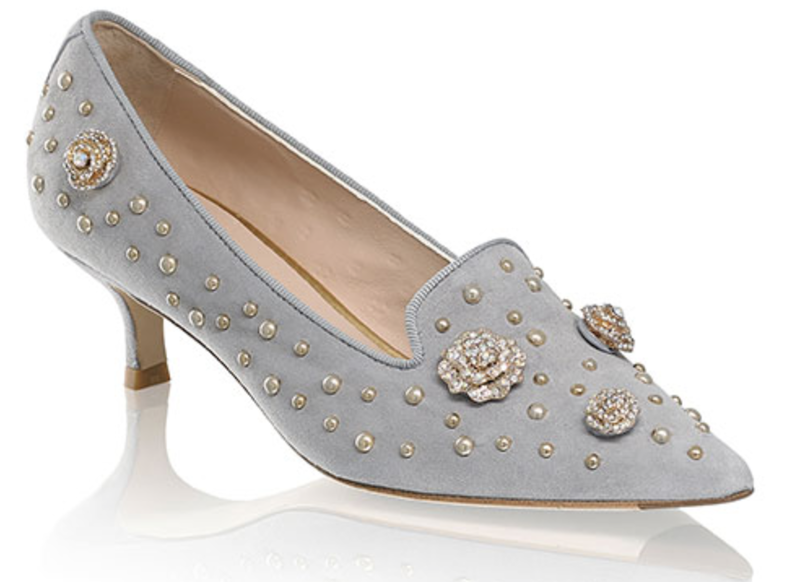 May wore her grey suit from Daniel Blake and the black Divine flats from Russell & Bromley. 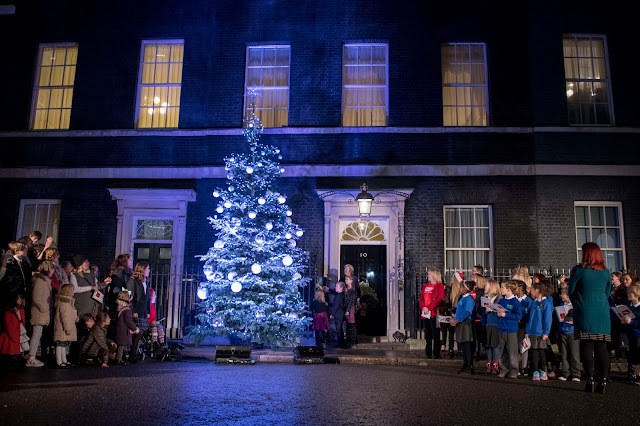 Thursday saw the PM switch on the Downing Street Christmas lights with the help of children from her Maidenhead constituency. 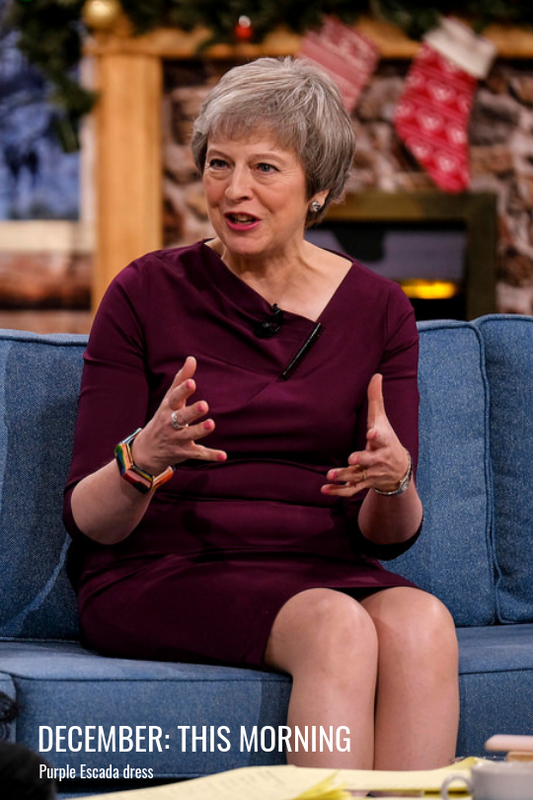 May wore her red Amanda Wakeley coat, a black dress and a pair of leopard boots. Festive! And on Friday, was back in Maidenhead, visiting St. Mary's Church and opening the extension at Cox Green School. 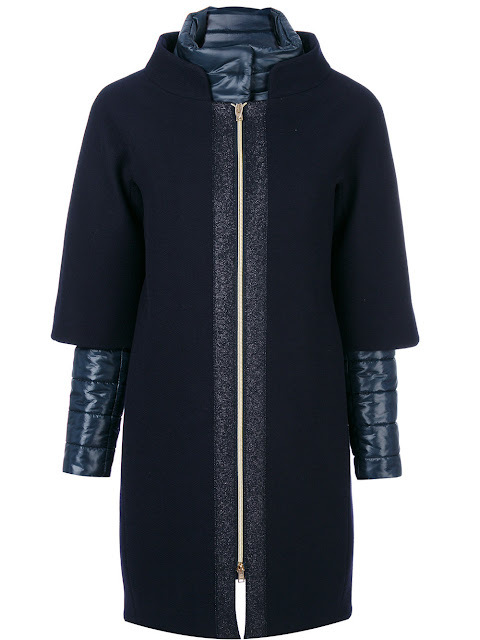 May wore her tweed Paule Ka jacket and kept warm in her navy Herno coat. 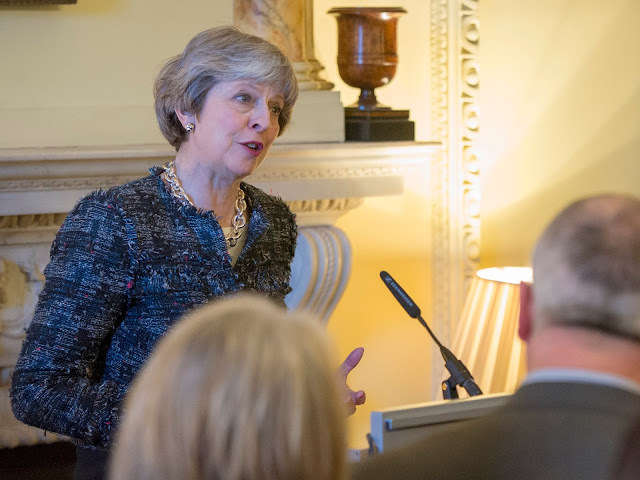 Have you had your eye on a Prime Ministerial approved item for the whole of 2018? 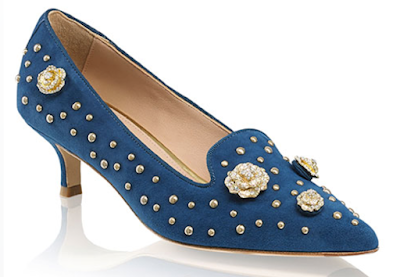 From shoes to accessories, the PM has sported some really great pieces this year. And if you've been well behaved and are currently compiling your Christmas list, these items should be ones that you ask for! Need some dancing shoes? 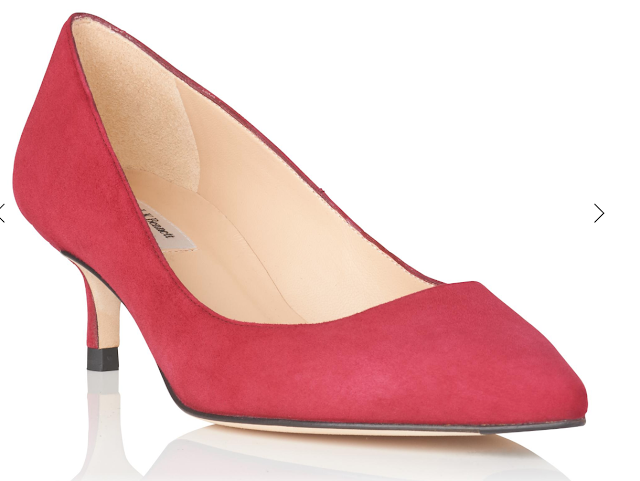 The Curve heels from Russell & Bromley made May a Dancing Queen - and the glossy red heel is the perfect conversation piece. 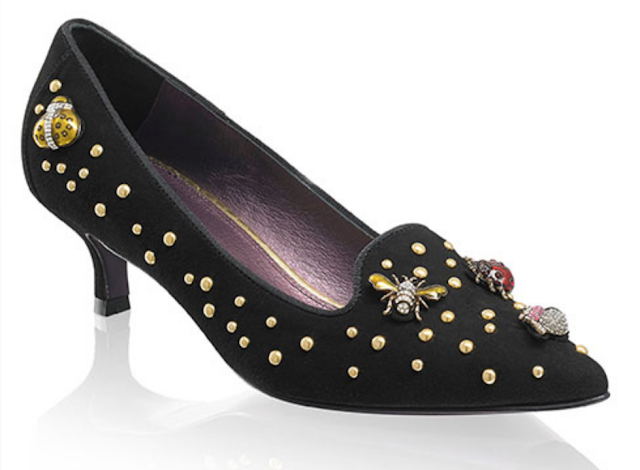 Sparkly and fabulously festive, we love the Humbug courts from Russell & Bromley. 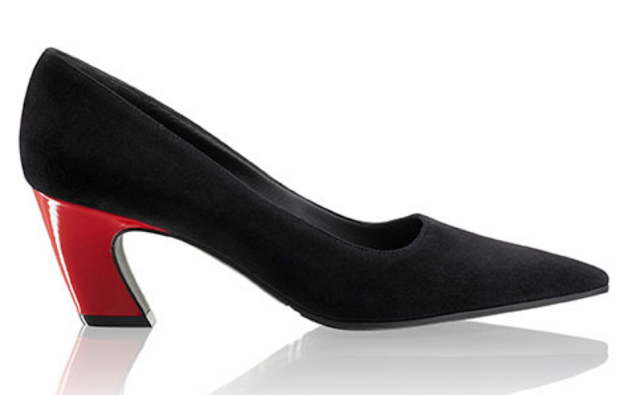 These are one shoe that will get you recognised! And for a traditional festive pop (that you can carry season to season,) the red Audrey kitten heels from LK Bennett are a great shoe investment. 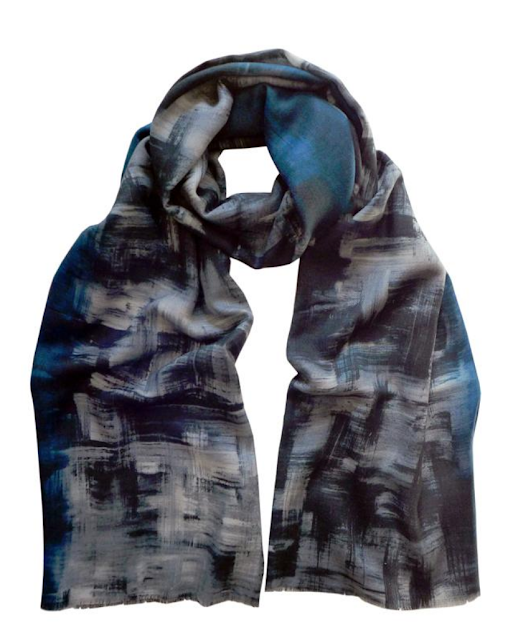 Keep warm throughout the colder months in a handmade bright Pazuki scarf. 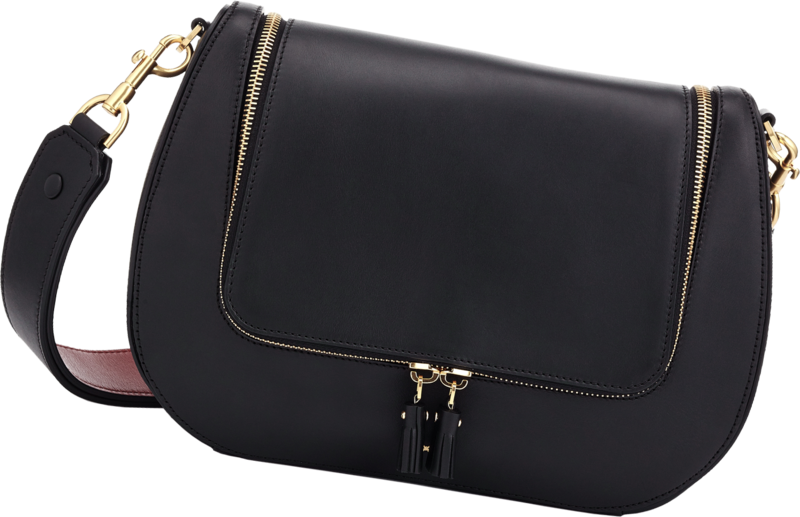 May has several of these in her wardrobe - we love the Shadowland design. 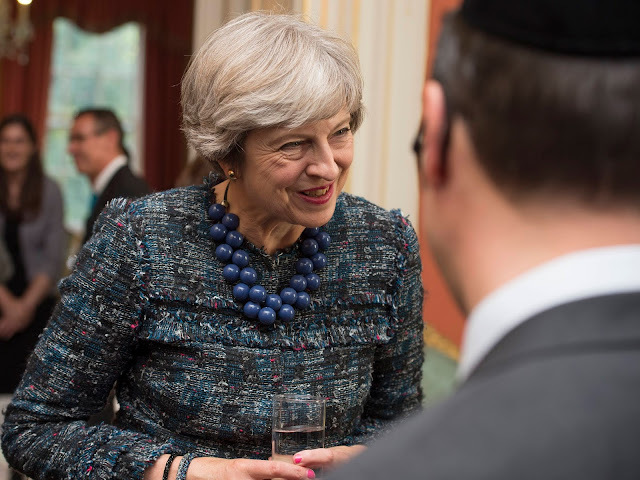 Those oversized bead necklaces that we frequently see the PM wear are by Italian based brand Mirta Bijoux. 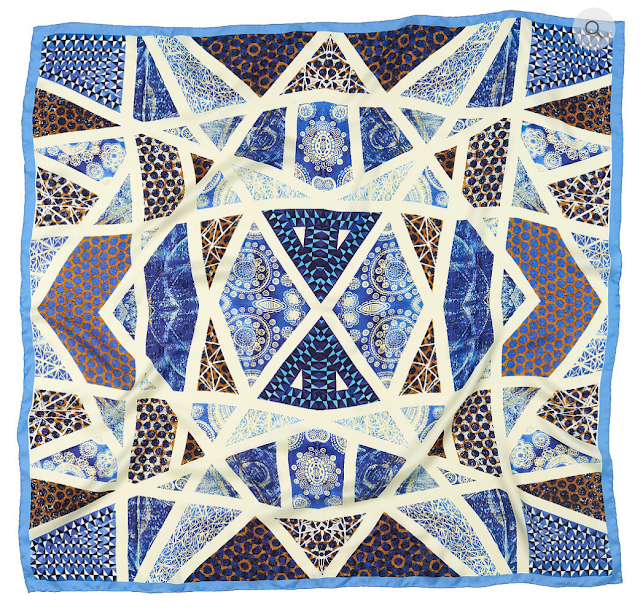 May has 5 - blue, red, black, mixed blue and silver- and there's a whole host to choose from! Silk scarves are a great investment and if your budget doesn't quite stretch to Hermes, take a look at Megan Ferris's range. 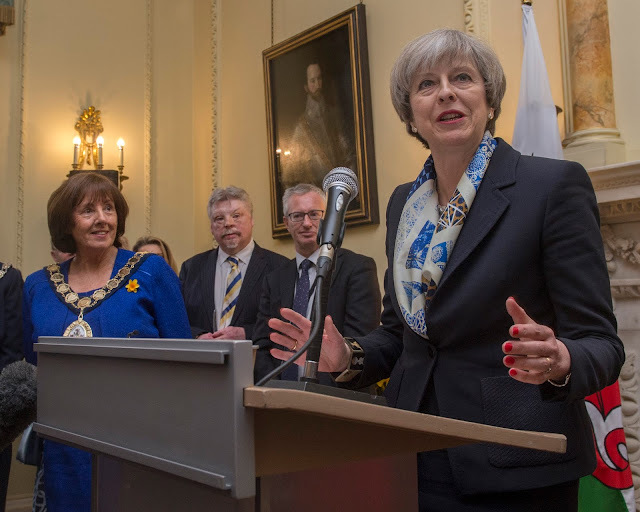 The PM wore one of her blue and white designs for St. David's Day celebrations in 2017. 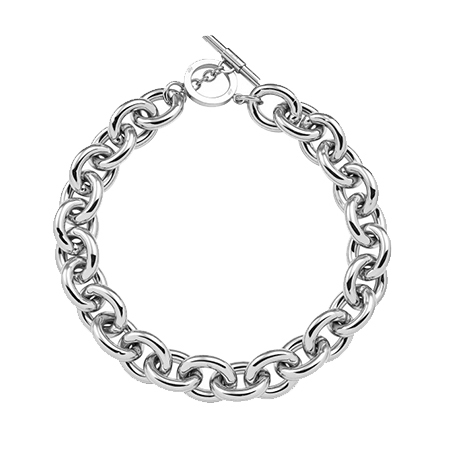 The chain necklace and bracelet from Amanda Wakeley is perhaps the most iconic of May's accessories. 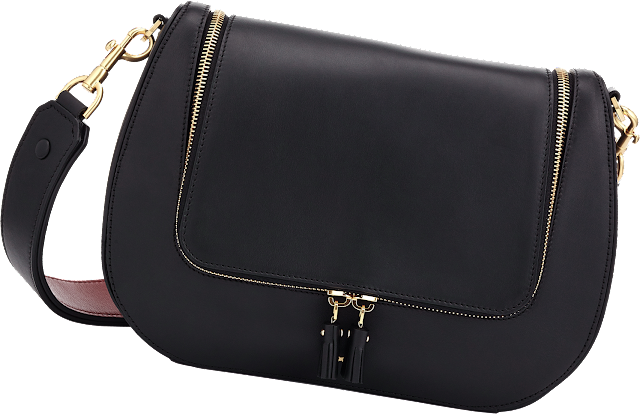 Available in silver or a contemporary rose gold, it's an essential that will stand the test of time - and it makes the perfect gift too! 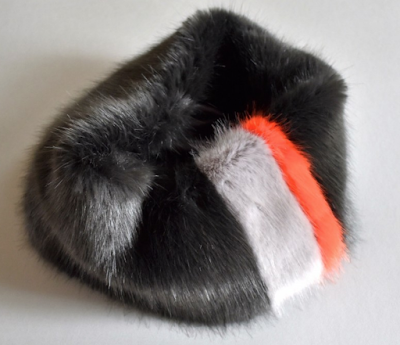 Last seen in Davos 2017, these unique faux fur snood from Louison'dor is pure luxe. Bring it back Theresa! 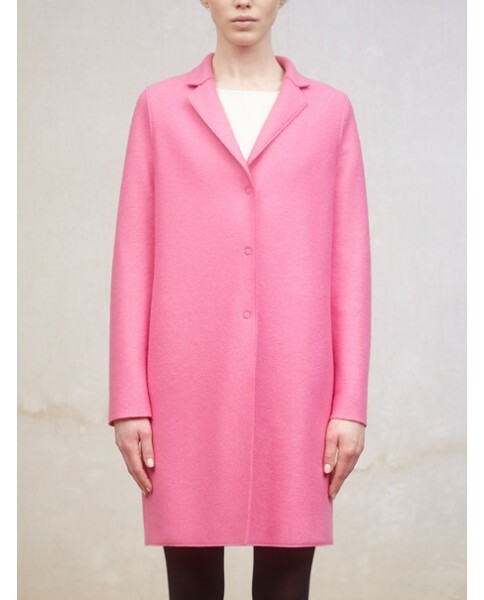 A great seasonal piece, a Harris Wharf coat will take you from winter to spring. 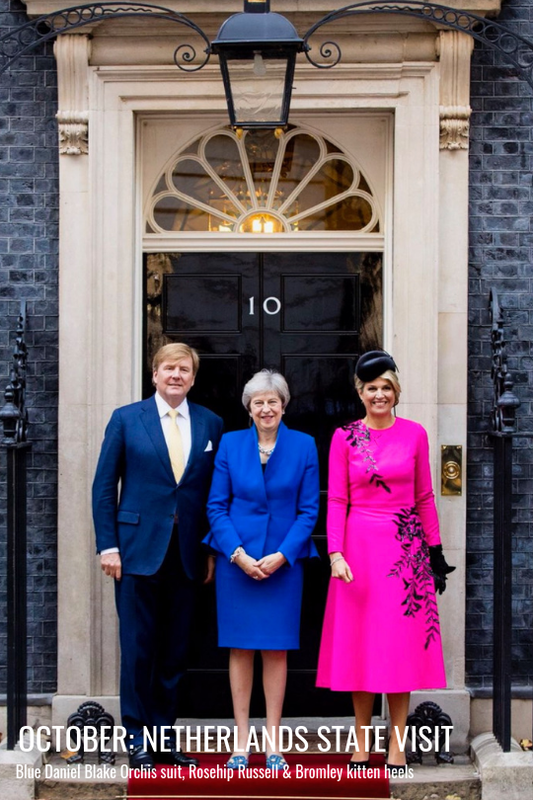 May's pink one is particularly stylish! I've a penchant for a snuggly coat, and Herno supplies them in spades. 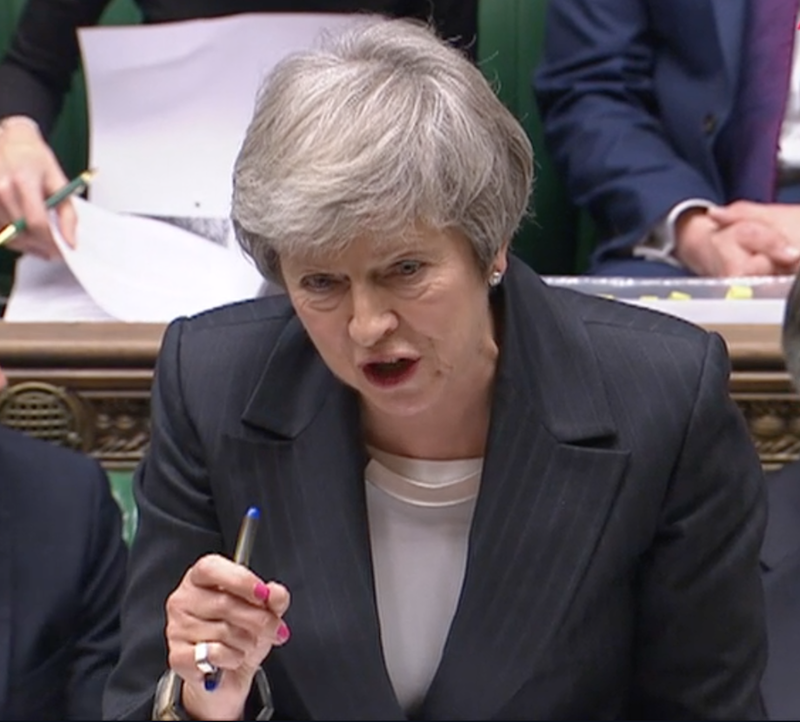 May has fully embraced the athleisure look and her navy wool and bodywarmer coat is my top pick. For a chunky knit or a fierce dress, Amanda Wakeley is your ultimate destination. This dress we love! What could be a more perfect present than a bespoke item of clothing? Daniel Blake creates beautiful suits, jackets and dresses for the Prime Minister - and this is a one off gift that I would love to receive on December 25th. 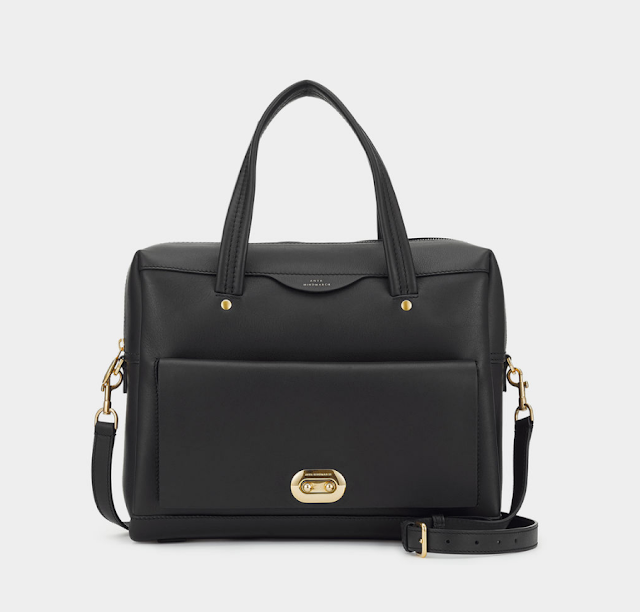 A staple for the PM, investing in an Anya Hindmarch bag is a solid choice. May's latest bag is the stylish Buddy model, although I am still very fond of the Vere satchel she carried throughout 2018. Which of these would you love to see under your Christmas tree?